10th August, 1965 and is currently working as a consultant in Dental Surgery in Ananthapuri Hospital. He had his early education in St. Joseph School and Mar Ivanios College, Trivandrum. Before joining Medical College, Trivandrum, he did both U.G. & P.G sutides in Trivandrum Medical College. Later took fellowship in Surgery from Royal College of Surgeons, Glasgow (U.K) (FRCS). Dr. Manoj is married to Dr. Rekha, who works as a consultant dental surgeon in Ananthapuri Hospital. Their elder daughter Namritha Manoj is medical student and younger daughter Neethika is in the 11th standard. 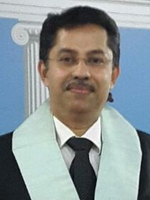 He is a member of the Association of Surgeons of India and Indian Medical Association. He is also a member of the Trivandrum Golf Club, Trivandrum Rotary Club and Doctors’ club, Kochi. An ardent sports lover, he used to represent the Trivandrum Medical College cricket team and played basketball too.